Make your apps stand out! Present your data as an easy-to-understand chart. Style it as you wish. Run it on any Android device. 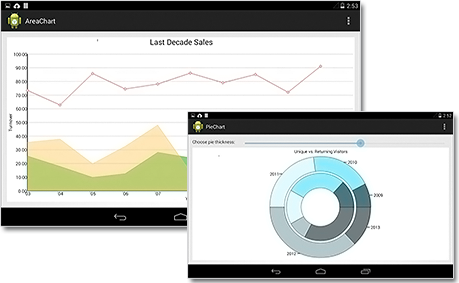 Charting for Android library is built entirely in Java and provides an easy and intuitive way to create the most common chart types - pie, doughnut, line, area, scatter, bar and combination. Each chart supports unlimited number of data series, each series has a variety of style options. The API is described in details, together with step-by-step guides and tutorials in the online documentation and in a desktop help file. MindFusion has prepared various samples that demonstrate all important features of the component and offer plenty of sample code to use. chart series supports custom labels, which are drawn according to its type: as inner or top labels in bar series, at data points in line series, as inner and outer labels in pie series. The colors for each series are customizable - you can set both the color for the fill as well for the stroke of the series. The component supports grid with several grid types. You can choose among several label types for the axes and you can add an axis title. The chart can have a title too.